Water: Horticulture's Next Game Changer? Why is water a game changer? While water is 100% renewable, changes in distribution, use patterns, and price will make our present patterns of water use unsustainable in the long run. By 2030, it is projected that water demand will outstrip availability by some 40%. Read more about water in the news. What would happen to companies if they were forced to pay the real cost of water? How will we be impacted by prolonged droughts that lead to more stringent landscaping and home water use laws? Water will surely be the game-changer of the next 25 years. This year's Seeley is a can't miss opportunity for the entire green industry to discuss this topic. The board has made a concerted effort to invite speakers from across the green industry: greenhouse, nursery, landscape and allied trade as well as water experts outside our industry. Bill Phillimore, Executive Vice President for Paramount Farming Co.
Join fellow industry leaders as we dive into the water topic. We believe the new, easier to access location, and a reduced registration cost that the Summit offers will be attractive to many leaders in the industry. Reserve your spot now! Seeley Summit: What would you do with 40% less water? The continuing drought in California and other parts of the country highlights a national trend affecting many in the green industry – the increasing frequency and magnitude of water scarcity. Globally, water demand is predicted to outstrip availability by 40% in 2030. The 2014 Seeley Summit is entitled Water: Horticulture's Next Game Changer? and provides a unique opportunity to learn and develop a multi-faceted approach to tackling this issue. The majority of green industry businesses are located in close proximity to urban centers. Expansion of urban areas through suburban development has brought both expanding business opportunities and increased competition for water resources. This applies not only to ground water, but also to public surface water, such as lakes and rivers. Without protective legislation, green industry firms are often expected to forfeit their current use of potable water for urban/suburban consumption. Even with such legislation, amounts permitted for production purposes likely will decline as demand increases for potable water by expanding urban centers. This has already occurred in Florida, where initial permitted amounts 12 years ago have been decreased by as much as 40% in some areas. Just 15 years ago, nursery and greenhouse irrigation was unregulated in these same areas. Technologies alone will not solve all of the industry's problems. The green industry, in particular, can play a very active role and lead by example in working toward water conservation and water quality preservation during discussions on water resource policy development. Without active involvement, green industry firms will not get policies that are equitable to them and instead will be left out in the cold. Dr. Ron Griffin, a resource economist at Texas A&M University will discuss the roots of the water scarcity problem -- primarily deficient policy signals for water's innate value -- and implications for the future policy environment in which water is allocated and priced. Part of the message concerns needed policy change, which can be anticipated by water users, and part concerns the future of water pricing and availability. Join Dr. Griffin and many other experts from both within and outside the green industry as we tackle the burgeoning issue of water scarcity. This year's Seeley will take place June 22-24, 2014 in Lisle, Illinois – conveniently located for ease of travel into Chicago O'Hare and Midway airports. Summits are intended to promote discussion of issues important to the future of commercial floriculture. The meetings are structured to foster discussion by industry leaders and increase the level of understanding of topics through presentations by speakers with a wide range of backgrounds and experiences. The goal of the Summit is to better prepare attendees to make decisions on issues that have a great impact on their businesses and the industry as a whole. Dr. Ron Griffin is professor of water resource economics at Texas A&M University, where he has been a researcher and teacher for more than thirty years. He is the author of Water Resource Economics: The Analysis of Scarcity, Policies, and Projects (MIT Press 2006) and the editor of Water Policy in Texas: Responding to the Rise of Scarcity (Resources for the Future 2011). He has served in editorial roles for four water-focused journals, including Water Resources Research. He specializes in water studies pertaining to demand, rate setting, marketing, and cost-benefit analysis. The Seeley Summit evolved from the Seeley Conference, which was established in 1986 in honor of Dr. John G. Seeley (1915-2007) after his retirement from Cornell University. Each year a topic important to the future of floriculture is chosen by the Board of Directors. After concluding the 26th annual Seeley Conference in 2011 and for the two years that followed, the Board of Directors conducted extensive research among past attendees and non-attendees and decided that a changed location and format was warranted. The 2014 Seeley Summit is the result. We offer a changed venue, a shorter program, and a more focused opportunity to hear from renowned experts in the field and to discuss the topic's relevance to individual firms and the horticulture industry as a whole. 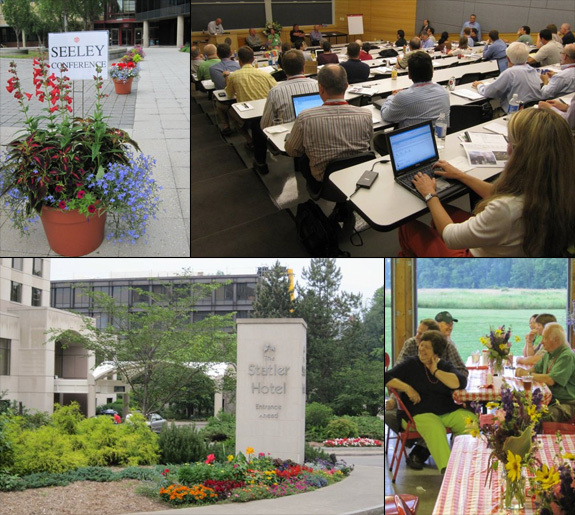 Seeley Summits are intended to promote discussion of issues important to the future of commercial floriculture. The meetings are structured to foster discussion by industry leaders and increase the level of understanding of topics through presentations by speakers with a wide range of backgrounds and experiences. The goal of the Summit is to better prepare attendees to make decisions on issues that have a great impact on their businesses and the industry as a whole. To assure free exchange of ideas, participants, including representatives of the trade press, are asked not to attribute comments or points of view to speakers or industry leaders unless such dissemination is agreed to by the person expressing their point of view. Phone: 607-255-2131 or 607-255-1789 or fax: 607-255-0599.